The H4 extension and change of status processing time mentioned above are same for L dependent visas too. H4 is a dependent visa for H1B workers in USA. H4 EAD processing time is available here. 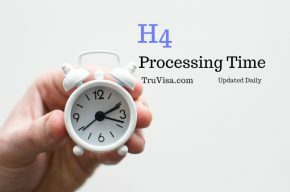 The H4 processing time data, updated daily, is collected using official USCIS data and H4 extension / Change of status processing time shared on various user driven online trackers and forums. Is H4 Stamping outside USA faster than H1B extension within USA? Yes, at this time, the H4 stamping outside USA in US embassy using H1B approved i797 is much faster way to get H4. If you are planning to move to H4 using Change of status application, it is better to go out of USA and get it stamped in passport. H4 visa stamping convert from H-1B eligible for Dropbox in US embassy? Yes, you may be eligible. Check your Dropbox eligibility for India. Travel outside USA when H4 extension is pending? Normally, you should NOT travel while your H4 extension is pending. But, the GOOD thing with dependent visa is that if you travel, you can directly go to US embassy for interview and get H4 stamped. In that case, you would NOT need the H4 extension application that you have filed (and is pending) in US. Find more H4 questions and reliable answers on TruVisa.com. Your H4 COS should be approved first to get H4 extension approval. 2) Considering my employer agrees to send the H4 EAD petetion as well along with my H1 Extension , Can i apply H1 Extension and H4 Extension and H4 EAD all Concurrently in Premium ? 3) Is it good to go for H1 Extension in Premium , considering the RFE’s around the corner , will that affect the H4 EAD ? The best option is to file all 3 together i.e. H1B + H4 + H4 EAD extension in PREMIUM. See this recent experience for H4 and H4 EAD when filed along with H1B in premium. You can file H4 EAD separately too after filing H1B and H4 using the H1B receipt number. So our I539(H1 to H4) and EAD (I765)petition was filled on 20th Sep in VSC. Since I765 processing time has already passed normal, we filled an enquiry through Senator. USCIS responded to the inquiry that I539 is pending due to security checks. Any idea what exactly it means and have some one come across this scenario and how long it can take to resolve this. Your question about H4 COS pending for security checks has been added to our forum and answered there as it is out of scope of this page.